Note: Avi Vantage release 16.3.2 uses SafeNet Network HSM Client Software Release 5.4.1 for 64-bit Linux. The same holds true for 17.1.x. 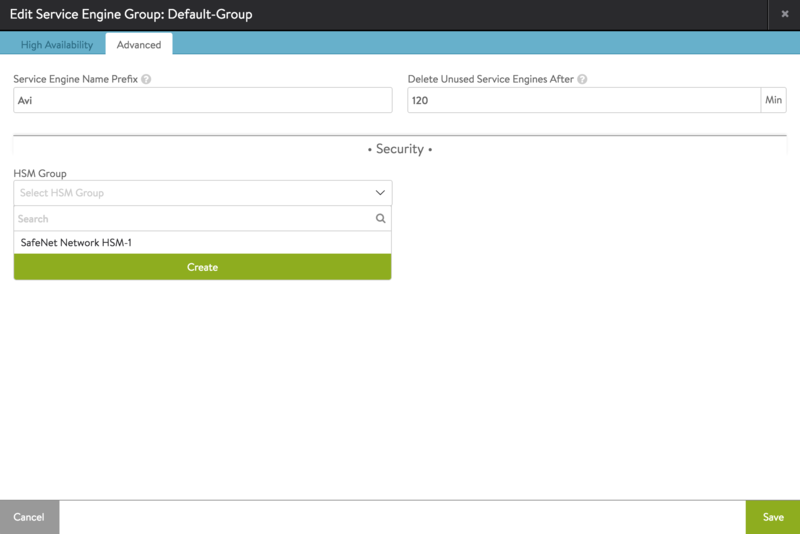 By default, Avi Service Engines and Controllers use their respective management interfaces for HSM communication. On CSP, Avi Vantage release 16.3.2+ supports the use of a dedicated Service Engine data interface for HSM interaction. Also, on the CSP platform, Avi Vantage release 16.4.1+ supports the use of a dedicated Controller interface for HSM communication. When one tenant uses a dedicated interface for HSM communication, all others must do likewise. 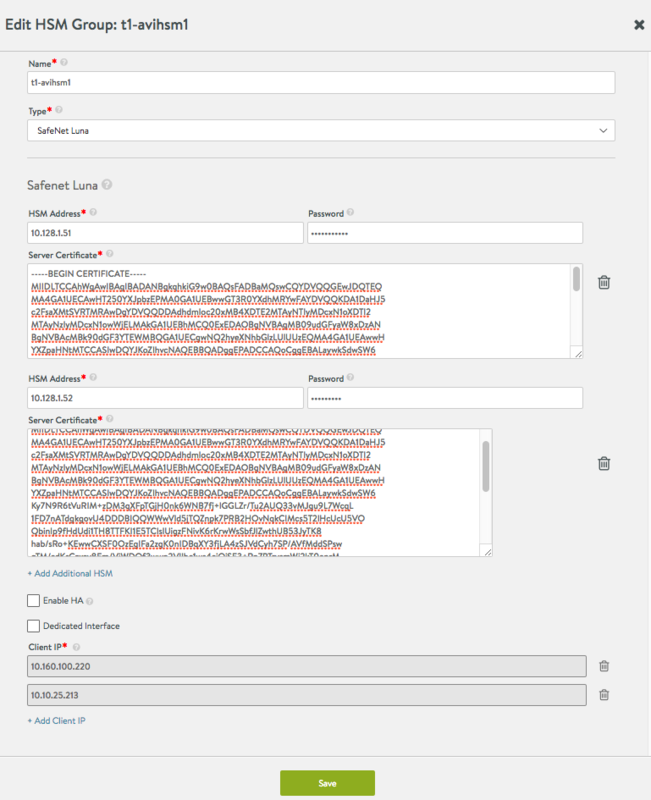 Similarly, when one tenant uses the management interface for HSM communication, all others must do likewise. Avi Vantage supports creation and usage of more than one HSM profile. Also, Avi HSM configuration supports multitenancy. The password field can be populated if the respective HSM partition passwords are available at this stage. Otherwise, this has to be done after client registration step below. Starting with 16.3.2, Avi Vantage automates configuration of HA across HSM devices. 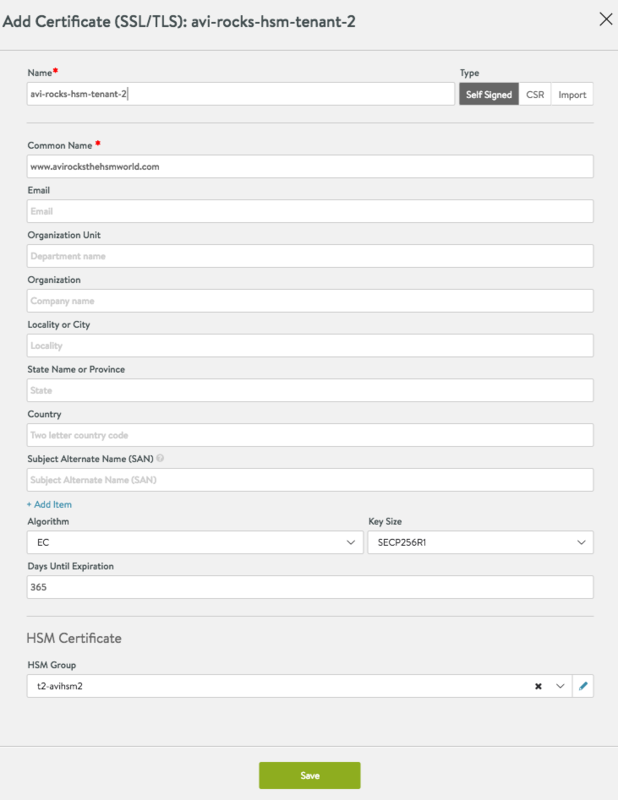 Before configuring HA, ensure that the clients are registered with the HSM using listSlots command. This command provides details about the HSM devices to be set up. The serial number provided in the output of this command is needed to set up HA across these devices. 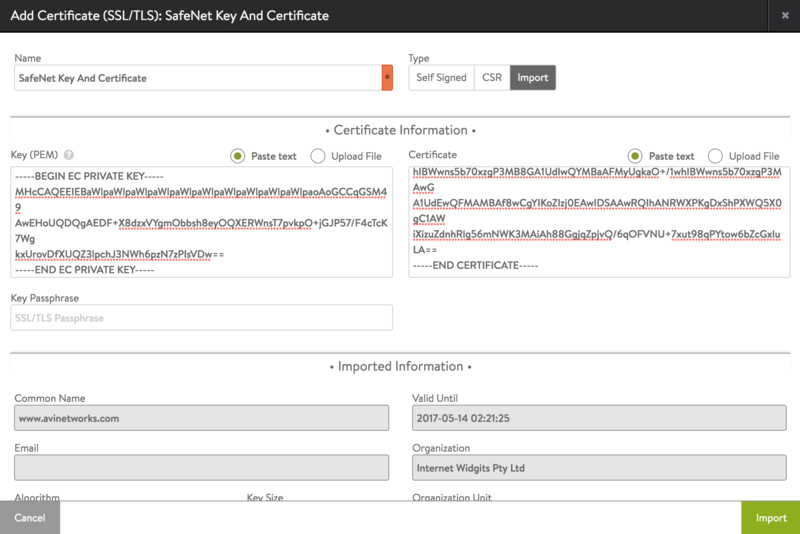 Verify that the partition serial numbers listed below match the ones set up on the SafeNet appliances or the ones provided by the security team.